Put all of the ingredients in a food processor with 4 tablespoons of boiling water and blitz until the mixture is finely chopped and well blended. Transfer the mixture to a bowl and shape it into 15–20 balls. 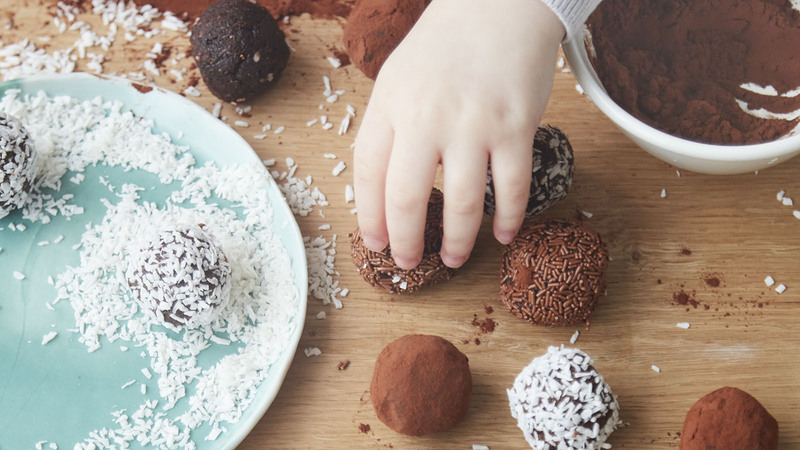 Roll the balls in cocoa powder, desiccated coconut or chocolate sprinkles, as you wish. Chill on a plate in the fridge for at least 1 hour to firm up before eating. The balls will keep in an airtight container in the fridge for up to 1 week. Real Food for Kids offers everything today’s parents are looking for once their babies are ready to start joining in with family mealtimes. Each dish is designed to be enjoyed by the whole family, while remaining simple, healthy, and not too salty or sugary for young children. With beautiful photographs and fresh design, this is an essential book for every modern parent.